It’s been an amazing journey for our Khalsa School students and teachers alike and this is an invitation to come along! One of the two major sevadars of the Sikh Coalition were recently honored at a reception given by Vice-President and Dr. Mrs. Biden. Did you know that they, and several other key sevadars of that wonderfully productive group of advocates were graduates of the Khalsa School in Bridgewater? So is a founder of Ensaaf, another great institution in our community doing yeoman service. So is a prominent member of the "Gurmat Sangeet: group and many, many other sevadars. Yes, by God's Grace, the fruit of the Naam is evident in the lives of these wonderful “children”. 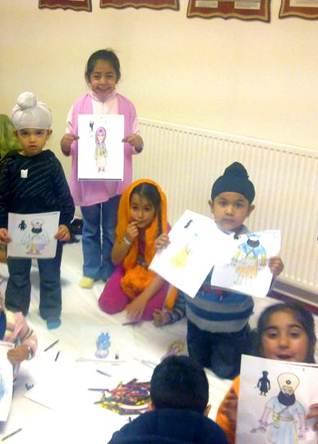 Wouldn’t you like to give your community’s children the same head start in the practice of Sikhi? The eventual blessings to both students and teachers are way beyond worldly time or personal sacrifice of parents, students and teachers. Two years ago, the Kid’s Corner section of sikhchic.com began publishing the Sikh History and Religion lessons taught at Gurdwara Bridgewater in New Jersey, with beautiful illustrations added so that teachers and pupils would find them attractive. The problem is, they have been difficult to access in a collected, book format. There were always three classes for each child at the Bridgewater Gurdwara - Shabad/Kirtan, Punjabi, and Living Sikh Religion and History. You are free to use the Living Sikhi lessons as they are reproduced here using the same text, or find other books. There are wonderful materials out there now so that kids at every level may have a rich experience. When we began, we teachers (who learned right along with the kids) had children in a wide range of ages. This meant that we tried to give very young kids of 5-7 age, hands-on coloring, memorizing names of Gurus, games, etc., and we enriched the program for the older kids with more sophisticated materials. All children were given opportunities for service within and without the community, from “napkin seva” to feeding the homeless. As the program grew, we could group the students by age or ability level. We also held a week-long camp every year based on a the life of one of the Gurus or a similar theme. Included was at least one fun outing/picnic, etc., and one demo/performance for the parents. By the way, a successful program attracts teens as well as eager young students. Find out what teens are interested in learning and develop a program that suits them. Willingness to do hard work, sincerity, an open mind, and respect for the growing minds and hearts of children and teens, are the requirements for teachers. Let's not forget what we have listened to many times in Gurbani - not all the facts and figures, dress, and/or rote learning in the world, make a life in Sikhi. What makes it happen is living in Sikhi. And that, quite frankly, is the beauty and glory of the Sikhs! Simran - begin each class with a minute of simran. It both calms and opens the heart to the higher consciousness and connects teacher and pupils with Waheguru, the True Source. Relevance - whatever the lesson, make it relevant to the pupils’ life experience. If there is no meaning, there is no life-long learning. This means that shabads must be translated in correct idiom, grammar and vocabulary to the child’s dominant language (easier now with Sikhnet); history/religion lessons must be tied to a meaningful practice of some virtue in the child’s daily life; and Punjabi, most usefully, will be helping the child to understand Gurbani. Practice - students will be given opportunities to practice a virtue at home and to feel safe to discuss how it went. Questions are encouraged, even though the teacher may not have all the answers. No judgments are made, nor will anyone force any behavior. Students will be encouraged and led by example to be respectful of each other and of the teacher. Abuse is not permitted and must be reported to the proper authorities. Every student whether alone or in a group will have an opportunity to sing a shabad in the sangat. 1: Baldev Singh (Bradford, United Kingdom), April 28, 2012, 8:28 AM. Very, very important subject! With myriads trying to win the hearts and minds of an increasingly distracted youth of today, it is always the basics which are most effective ... such as having loving, caring, ethical parents, and having fantastic teachers at school. My teacher, Mrs Gaunt, nurtured something special in me akin to what the Guru has done since I left her fruitful class, yet her warmth, kindness and caring attitude still lingers in my psyche. 2: Sangat Singh (Kuala Lumpur, Malaysia), April 30, 2012, 5:23 PM. Kavita (her real name) is an unusual teacher from Gurgaon (India) presently visiting Malaysia where she had spent a good many years before returning to India with her daughter and expatriate husband. As a gifted teacher, her usual routine was to spend the first 10 minutes or so, surrounded by boisterous kids, talking, laughing or just plain hugging and just lending ears to the kids. One day her stern principal wandered in and was shocked to see such a scene. Kavita was promptly hauled in to explain her conduct. "Madam, these kids, although they come from affluent homes have little interaction with their parents who are far too busy keeping up with the Joneses and hardly have any time for their emotionally starved kids. I try to fill that gap. Please check their results, you will find above average performance. Is this not what a teacher must be doing for the impressionable kids?" A king once wished to present a jewel to the noblest in the land. His prime minister selected the foremost painters, writers, scientists and philanthropists. On the appointed evening, the prime minister selected, from the galaxy of famous men who had been brought to the center of the hall, a simple little man whose face and achievements were unknown. The King inquired on what basis the man had been chosen over the others in the realm to receive the title "Jewel". The prime minister replied: "He is the greatest of all, Your Majesty. He is your teacher." 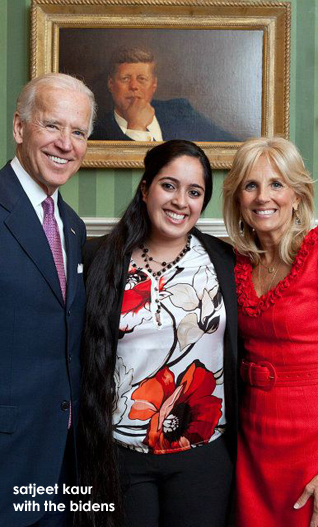 3: Veronica Sidhu (Scotch Plains, New Jersey, U.S.A.), May 12, 2012, 5:17 AM. Comment on "Nurturing The Nursery Of Sikhi "